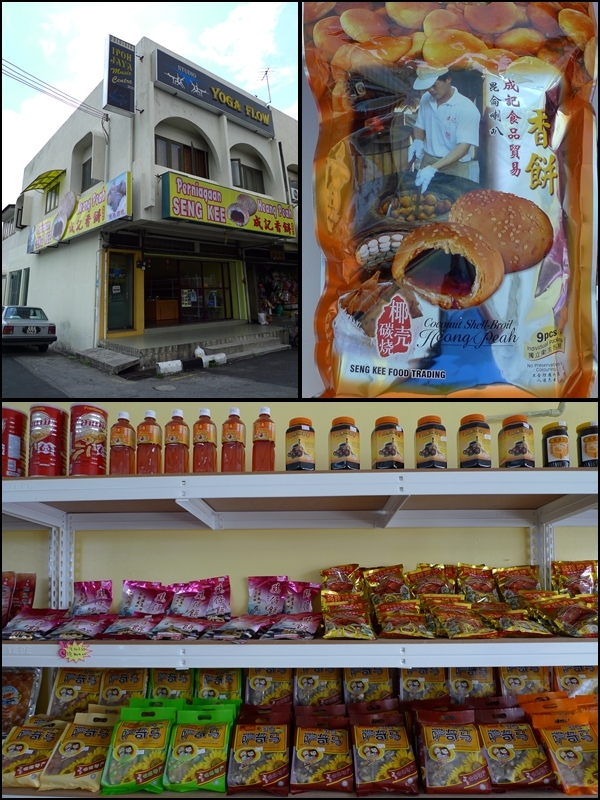 Heong Peng, or Heong Peah, or Heang Peah (literally translated to Fragrant Biscuits) is one of Ipoh’s most famous pastry (if not THE most famous), widely marketed and commercialized thanks to the commendable efforts of Yee Hup, one of the most popular brand of Heong Peng originating from Gunung Rapat. I unabashedly admit that I grew up on Yee Hup’s traditional Heong Peng (those crispy/flaky pastry skins with sticky and sweet maltose + shallots filling) produced by broiling/roasting the biscuits in an enclosed oven-like clay jar (think how they make Naan bread, and you’ll get a rough idea), fuelled by burning coconut shells. The production site – See those cute, round-ish biscuits ‘attached’ to the walls of the oven? And the dried coconut shells as fuel to broil those pastries. But as time goes by, success breeds contempt, and after awhile, contempt turns to greed. Nolah …. just that Yee Hup was doing such brisk business, it’s practically unpractical (aiks, metaphorically speaking?) to mass produce the well-loved biscuits the traditional way from home, with orders and walk-in customers pouring in relentlessly. On a side note, ironically, another confectionery is facing the same problem as of now. Sin Eng Heong (click HERE for the review) that produces delectable kaya puffs is on the receiving end of customer’s wrath day in and day out, for they’re trying desperately to cope with the huge amount of orders, and constantly mistaken for being arrogant for turning people away. Soon, they’re gonna go the machinery/modernized route, and then we’ll see another long-lost tradition in the making. Back to the Heong Peng story, Yee Hup proceeded to expand successfully, with branches opening left and rights, but the modernized method of baking the pastry in ovens, losing the traditional touch, as well as the authentic, smoky fragrance of the Heong Peng from days of yore. Not that I’m THAT old, mind you. But along came Seng Kee Food Trading, an exclusively-hidden gem in Gunung Rapat, STILL producing and selling the delightful biscuits in the same, old way (in the compound of a house), and had yet to venture towards the commercialization route, aka the BANE of tasty & traditional foods (Yik Mun’s pau, anyone?) and drinks (think Old Town White Coffee). You’d probably wheeze past without even noticing what-in-the-world they’re selling! The array of local delicacies, from biscuits to snacks, and 3-in-1 beverages to their very own products @ Seng Kee Heang Peah Enterprise. The upper right is the nicer, individually-packed Heong Peng, at RM6.50 for 9 pcs. But back then, I was not aware of their other shop (a REAL shoplot, a short distance away) in Ipoh Jaya, which opens for business daily except Wednesdays, and far easier to locate than the house I mentioned previously. Say, if you’re lost in Gunung Rapat trying your desperate best in search of the house (Seng Kee Food Trading) manufacturing these sweet babies, don’t lose hope just yet. Return to the main road, and within minutes …Voila! You’ll find Seng Kee Heang Peah Enterprise at a corner of a row of shops in Ipoh Jaya. The shop has been opened since August of 2008, and sells other products aside from the ubiquitous Heong Peng of Gunung Rapat. Other confectioneries produced by Seng Kee include the ‘Yat Hau Sow’, a crumbly cookie-like creation not unlike ‘Hup Tou Sow’ aka Walnut Biscuits. Words can’t describe the exact sensation or taste of the Heong Peng produced utilizing the old, broiled with coconut shells method. The roasted, smoky fragrance is evident (that’s why they’re called HEONG peng, I supposed? 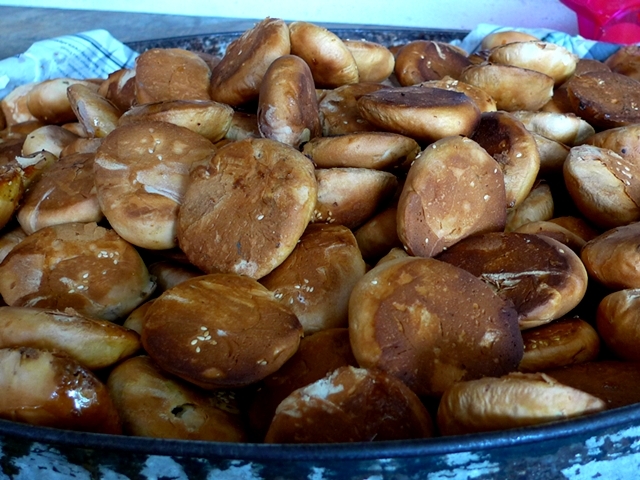 ), and the pastry remains crispy even after a few days. Sesame seeds are sparsely sprinkled atop the biscuits, and the sticky, almost too sinful filling of maltose, shallots, sugar and oil is irresistible. Full monty in action – Fully-clothed, Half gone. And discovering the sickeningly-sweet/tooth-numbing filling in the centre. The word BLISS comes to mind, naturally. Have them for breakfast, or tea time with a cup of tea or coffee, and watch the hours flowing by, effortlessly. Aaaah …… I’m soooo in the weekend mood NOW. Location : Seng Kee Food Trading (the house) @ 177, Lorong Gunung Rapat 3, Gunung Rapat, 31350 Ipoh, Perak. Tel No : 605-312 0972. H/P No : 6012-507 0728. Location : Seng Kee Heang Peah Enterprise (the shop) @ No 2, Selasar Rokam 11, Taman Ipoh Jaya, 31350 Ipoh, Perak. Tel No : 6012-563 0717. Opens daily except Wednesdays. From 9am until 7pm. On Mondays, the shop closes at 9pm, due to the night market in the area. Here’s a GOOGLE MAP to both places, within the vicinity of Gunung Rapat in Ipoh, Perak. hi..good morning… good to be here again.. actually i dont know where seng kee is, i will go look for it this weekend cos all along i only took this from yee hup.. i prefer less sugar ones..
i tot of going to taiping this weekend too.. will rummage thru yr blog for taiping food.. any suggestions? Oh…this is the way they mass produce the heong phneah, no wonder it tastes good! reanaclaire : the low sugar variety is good for those who dont prefer their snack sweet, but notice that without sufficient fillings, the biscuits tend to be slightly harder. Taiping food? I'd suggest Mr BBQ Restaurant, or Kok Beng Chicken Rice. Kuala Sepetang seafood and Mee Udang Mak Teh seem like popular choices as well. though the latter got hygiene problems. Little Inbox : this is the original, authentic way of manufacturing them. nowadays, bigger factories have different modernized means to produce them. allie: try this. you may like this more than the commercialized versions. Cumi & CIki : something new eh? I was always fascinated by the production of Heong peng in old, rundown houses. email2me : no problem! but i gotta dig elsewhere for other food finds. unlike penang, where every corner you're bound to find something worthy. You need to call and order first. Preferably 2 days in advance. Last weekend I went and was only allowed to buy one packet. It's really heavenly. But you have to eat it within a day or two. Otherwise it will lose its aroma. I went to this place once, when I have not even started blogging. Since then, have always bought it from the shop. It tasted good with that special aroma. thule aka leo : hahaha, can try buy the kaya puffs, or the ching han guan biscuits. sp lim : really? but we called and booked in advance, when buying in bulk. i'm still eating that packet i bought last weekend. still ok.
i love the in sight story of this heong beng. unsure if this is good but i love the one from taiping called ????? how come ipoh 'heong peng' is so similar to penang 'heang piah'?! haha..
ai wei : aiyo, cannot read Chinese lah. =P is it from Aulong? hcpen : same? Penang ppl commonly call them 'Ma Tai Sou', the supposedly correct way to name them. Yummy, I love heong peng. 🙂 Yea, Yee Hup is really commercialized until Kampar restaurant Kam Ling is selling them too! Talk about coverage. Looks very tempting & crispy!! Feel like having a bite of it..
iamthewitch : they're everywhere! if i rmbr correctly, even wing loke yuen is selling them, alongside other biscuits. wow… the heong peng is my favourite =p ipoh.. i am thinking of travelling there alone… is that easy? I love the heong peah so much! Ok, next time when i go to Ipoh will visit this place. Thank you very much for the information. fufu : no problem lah! where you staying now? tg malim also you can conquered (hehe) … Ipoh not a problem. My Taste Heaven : you're most welcomed! You are right, can pop a few esp if its straight frm the oven!! yums!! 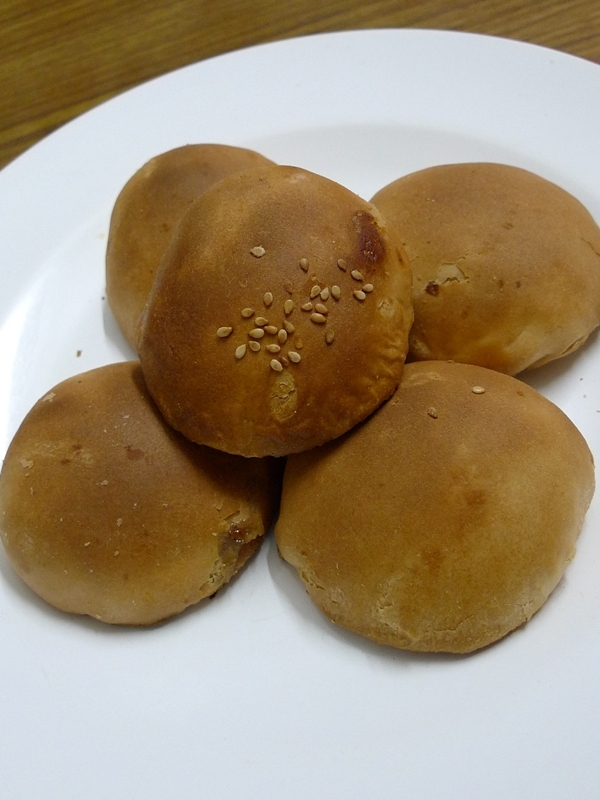 A true “heong peang” connoisseur will prefer this type of traditional baked ones rather than the over-commercialised oven-baked Yee Hup biscuits (sorry no offence intended). I do agree with that. 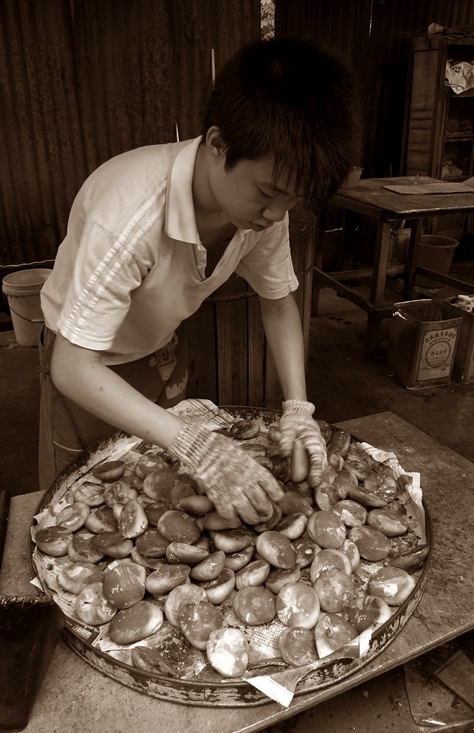 in Ipoh, there are 3 outlets selling the traditional style of broiled heong peng. one being Seng Kee, and another being the brand 189, at a house/shack near to the school in Gunung rapat. 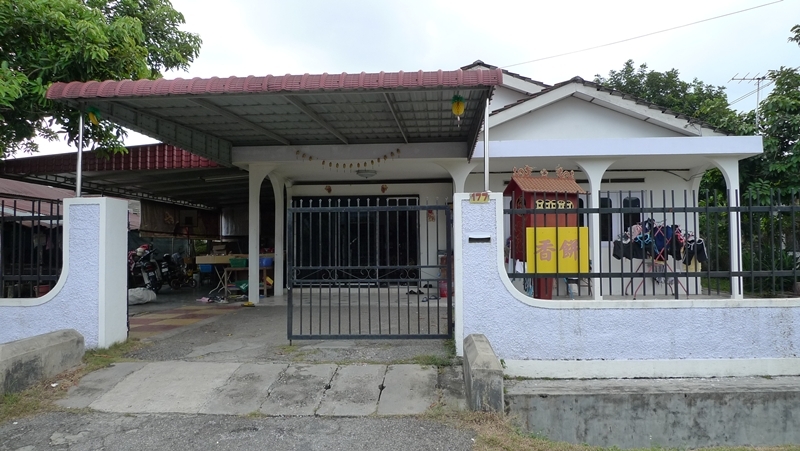 The shop no more d .. become kedai cermin mata liou ……. sigh …….